With over 4 million articles, Wikipedia is an invaluable resource, whether you're throwing a term paper together at the last minute, or hastily trying to back up your claim that you totally know what the luge is. But follow enough links, and you get sucked into some seriously strange places. We explore some of Wikipedia's oddities in our 4,446,864-week series, Wiki Wormhole. What It’s About: Since 1968, when an illustration of a skier named Schuss became the unofficial face of the Grenoble Winter Games, every Olympic Games has had one or more mascots—usually an anthropomorphized animal character, although some are human and some are more abstract—that features in that year’s Olympic logo and in promotional materials. While the Olympic promoters are no doubt going for cuteness, the results usually range from terrifying to merely horrifying. For a chance of pace, we occasionally get baffling, like the 1972 Munich games' Waldi the Dachshund, who was introduced on the logic that dogs with inch-high legs surely represent the athletic ideal. Strangest Fact: London’s 2012 Summer Games may be best remembered for the logo which looks disturbingly like Bart and Lisa Simpson engaged in inappropriate behavior, but their mascots were equally unsettling. 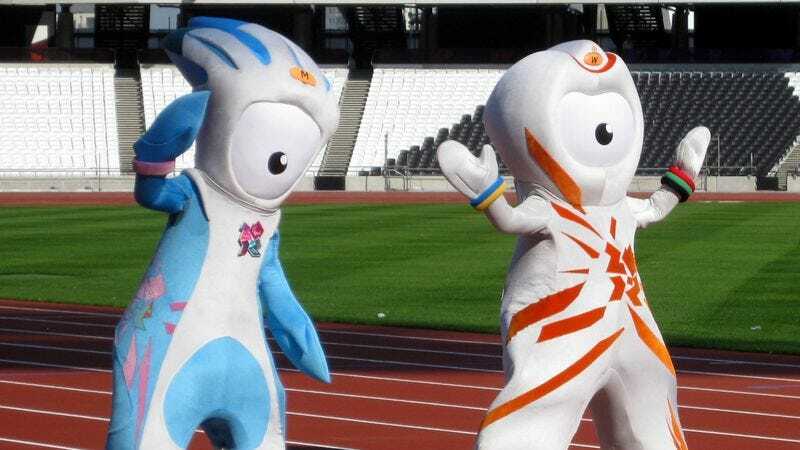 Named Wenlock and Mandeville, they’re roughly humanoid drops of steel, each with a camera as its single eye. The duo have been compared unfavorably to the result of “a drunken one-night stand between a Teletubby and a Dalek,” and in another Simpsons reference, alien overlords Kang and Kodos. Controversy: To no one’s surprise, even the mascots at this year’s Sochi Winter Games are controversial. First, the mascots were chosen by a referendum among the residents of Sochi, which ran on the same ballot as the 2008 Russian presidential election. A dolphin mascot was the clear winner, but the Sochi Organizing Committee threw out the results, insisting that the rest of the country should be consulted. When that happened, popular choice Ded Moroz (Father Frost, a Santa-like figure in Slavic cultures) was taken off the list when someone realized that, if he were adopted as a mascot, his likeness would be the property of the International Olympic Committee. Of the nine remaining candidates, eventual winner Snow Leopard saw his number of votes skyrocket after Vladimir Putin named him as a favorite, leading to claims that the vote was rigged. The designer of the 1980 Moscow Games logo, Misha, accused Sochi’s bear mascot candidate of being plagiarized from his work, and some accused the same bear of being too close to the logo of Putin’s United Russia political party, claiming it was propaganda. Alongside Snow Leopard, Bely Mishka the polar bear, and Zaika the hare also won, and have been untainted by scandal. So far. Thing We Were Happiest To Learn: Even made-up animals get their chance to shine as Olympic mascots. The 2010 Vancouver Olympics featured four mascots, only one of which was an actual animal (Mukmuk the marmot, who played sidekick to the mythical mascots). The other three included Sumi, a guardian animal spirit with the wings of a thunderbird and the legs of a black bear; Miga, a mythical part-bear-part-killer-whale; and Quatchi the sasquatch. According to Wikipedia, Quatchi is interested in regional dance and cuisine, and dreams of being a hockey goalie. Because, let’s face it, he may be a mythical fur-covered monster, but he is still Canadian. Thing We Were Unhappiest To Learn: Besides being ahead of us in manufacturing, high school test scores, and smog production, China’s also got us beat in Olympic mascot naming. The 2008 Beijing games had five mascots, Beibei (the fish), Jingjing (the panda), Huanhuan (the Olympic flame), Yingying (the antelope), and Nini (the swallow). Combine their names, and you get Bei jing huan ying ni, which means “Beijing welcomes you.” Just a tiny bit more thought went into that then Izzy the Computer Generated Blob from the 1996 Atlanta Games. Also Noteworthy: While Sydney’s 2000 Summer Olympics had three official mascots — Olly (from “Olympics”) the kookaburra, Syd (from “Sydney”) the platypus, and most groan-inducingly, Millie (from “Millenium”) the Echidna (a particularly bizarre egg-laying mammal that falls into the biological category of “Only In Australia”). But most beloved of all was the Sydney Games’ unofficial mascot, Fatso the Fat-Arsed Wombat. Fatso was created for Australia’s comedic sports TV show The Dream With Roy And HG as a joke protesting the commercialization of the official mascots. Fatso upstaged the official mascots to the point where the Olympic Committee tried to ban him, and Sydney was flooded with bootleg Fatso memorabilia. Eventually, Sydney officials gave in, and a statue of Fatso stood outside Sydney Olympic Stadium until it was stolen in 2010. Best Link To Elsewhere On Wikipedia: The Olympic Flame is always fascinating, but we keep coming back to Echidna, animals that make their cousins the platypus look normal by comparison. Besides having the platypus’ odd collection of traits from unrelated animals (in this case, hair, spines, long beaks, and egg laying), they also use electroreception, a method of detecting electricity also used by cockroaches and bees. They also only enter REM sleep if the temperature is in the 70s (roughly), suppressing that part of the sleep cycle if it gets too hot or too cold. Besides the Olympic mascot named above, the only other famous Echidna is Knuckles from Sonic The Hedgehog.